In the Wake of the Plow | Stories about the world of agriculture, food, and beyond. Politics, history, restaurants etc.. With an emphasis on Illinois and surrounding states. 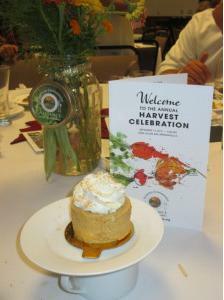 Featuring small plates from chefs representing several prominent Central Illinois restaurants, the 2015 Annual Harvest Celebration took place at the State House Inn in Springfield Sunday night. The annual celebration of the use of locally sourced ingredients benefits the Illinois Stewardship Alliance in their quest to get the word out about local food and sustainable farming. The restaurants included in the event are well known for serving locally produced and sourced food and farm products. The creations the chefs served spanned everywhere from Zucchini Agrodolce with Flank Steak, Corn Custard with Pork Rillette, Peach & Pork Belly Marmalade, Vietnamese Bun Thit, and Winter Squash Tamale with Grilled Pumpkin Crema. Dave Bishop of PrairiErth Farm in Atlanta, Illinois was the featured speaker.